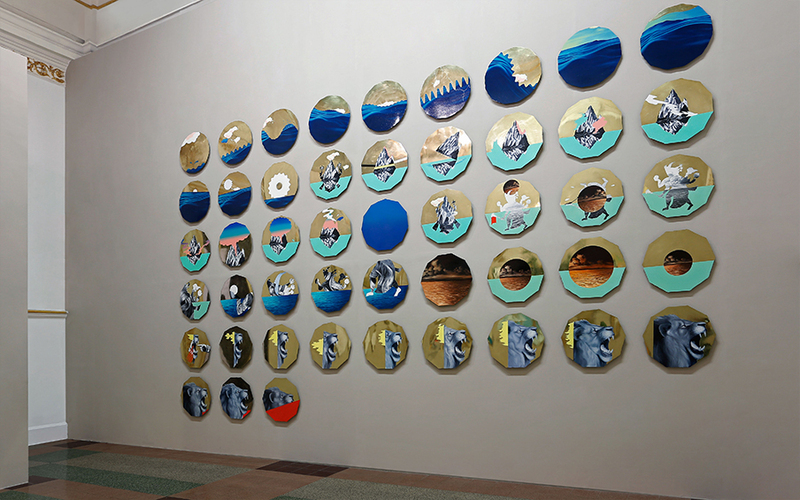 artist duo Thukral & Tagra. 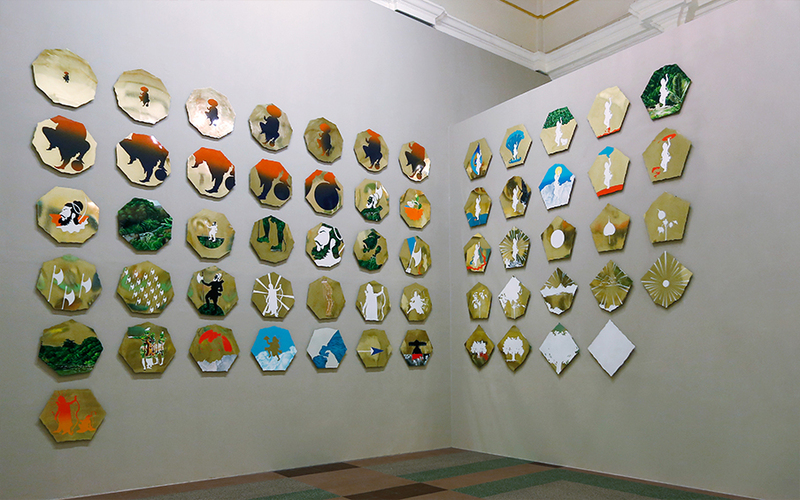 This show is part of the series of curated exhibitions titled ‘Engaging Traditions’. 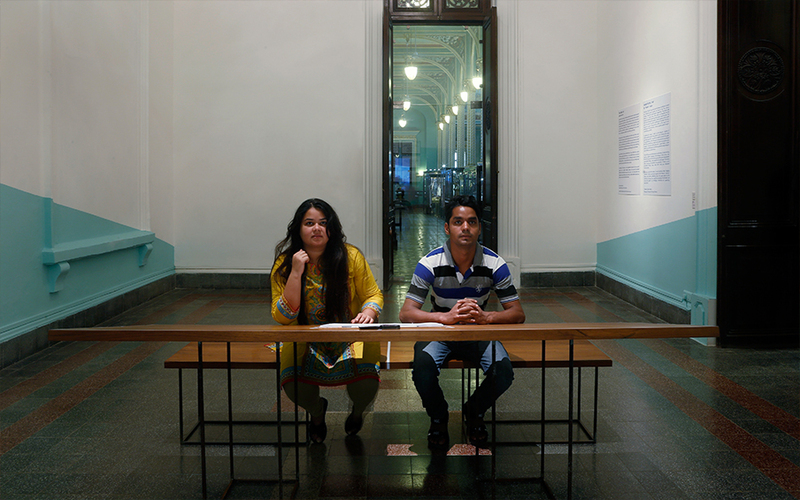 Artists are invited to respond to the Museum’s collection, history and archives, addressing issues that speak directly to the traditions and issues that underlie the founding of the Museum, yet evoke the present by challenging orthodoxies and questioning assumptions. 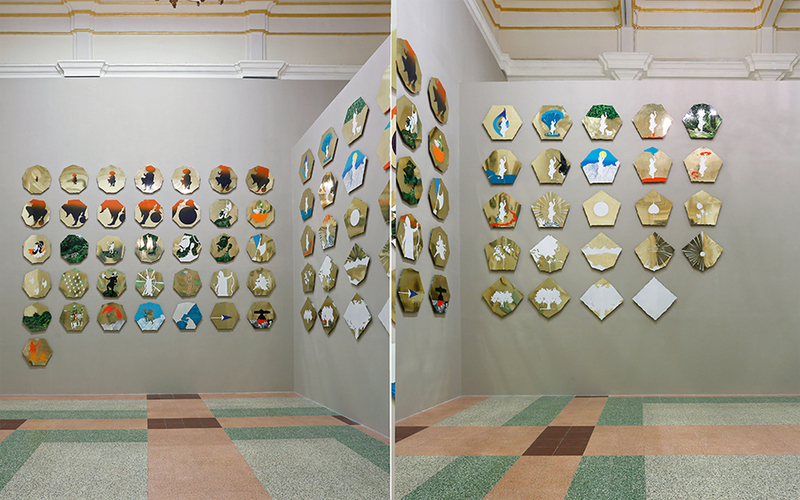 Artist duo, Thukral & Tagra draw from the Museum’s collection of ancient and traditional games, exploring the idea of ‘play’ from cultural, strategic, physical and psychological perspectives. 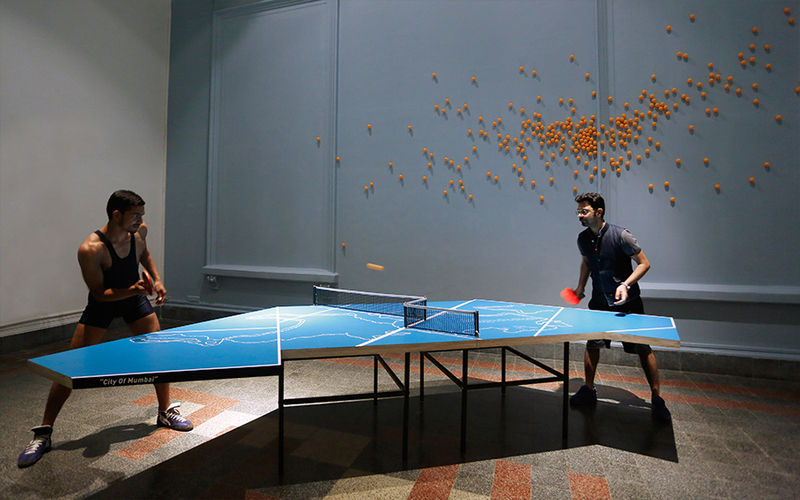 They envision the Museum as a gaming arena, where games are categorized into the physical, mental and spiritual, spanning the past, present and future. The artists have reinvented these games to create experiences that are both playful and serious. 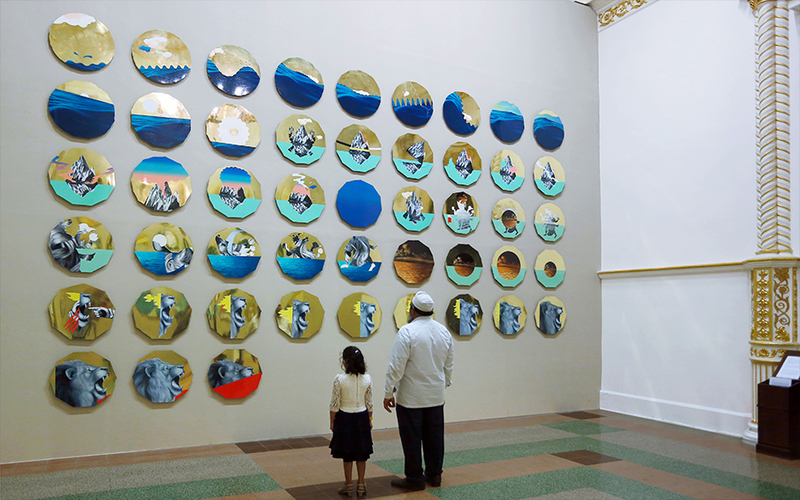 The viewer is challenged to think about life’s many aspects as a game of chance and to reflect on the nature of their participation in both life and art. 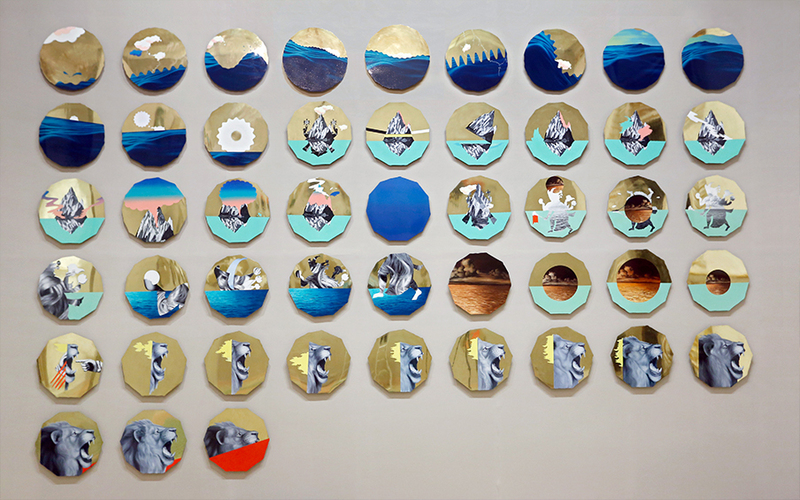 The work explores tradition through a contemporary sensibility. 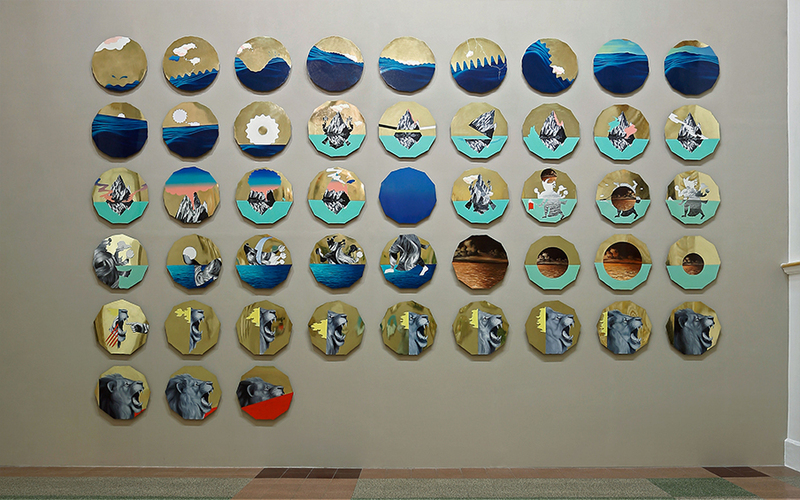 The artists interpret “life” from various perspectives, exploring the significance of different types of games, both formal and casual, reinventing them to create experiences via a competitive environment that often involves the viewer and causes him or her to reflect on the nature of their participation in both life and art. The artists will envision the museum as a gaming arena or stadium, where the games are categorized into the physical, mental and spiritual, spanning the past, present and future. 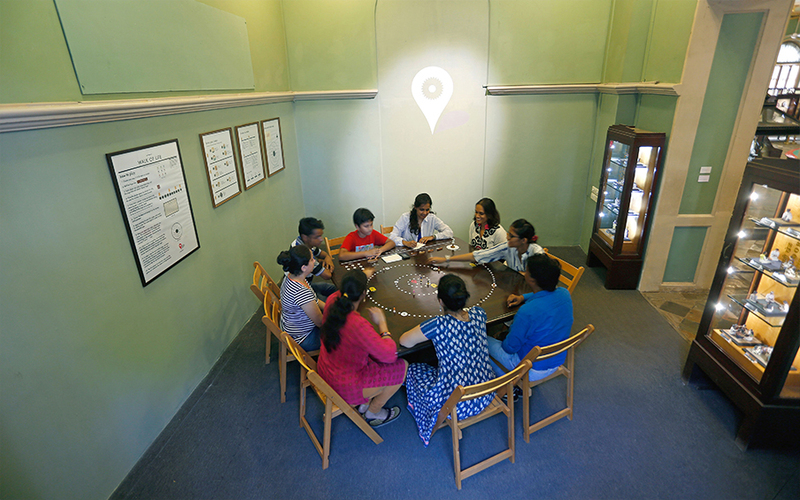 The game is built upon the ancient Indian game called Ganjifa, Originally played with a set of 120 cards, the artists have turned it into a board game that depicts Dushavatar, the ten earthly incarnations of the Hindu god Vishnu. The avatars can also be considered as the evolution of mankind: from fish, to reptile, to mammal, to human, to deity. The game aims to impart the meaning of life to those who play it, in effect by paying off one’s ‘debts’ and equalizing one’s ‘scores,’ which are recorded on the card of Karma. The artists have used the original sets of Ganjifa cards found within the museum’s collection as the inspiration for a series of new paintings which will be displayed in the first floor galleries. 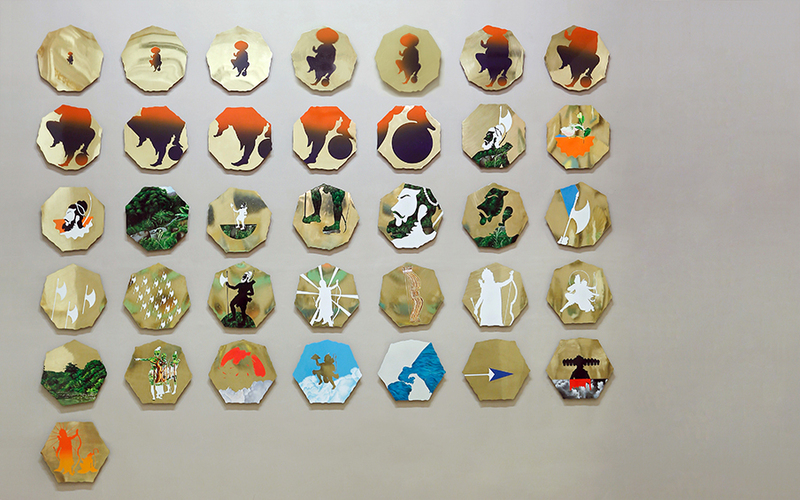 Elaborating each of the ten avatars into 12 paintings of abstract symbologies, a total of 120 paintings on shaped brass plaques narrate the evolution of life. 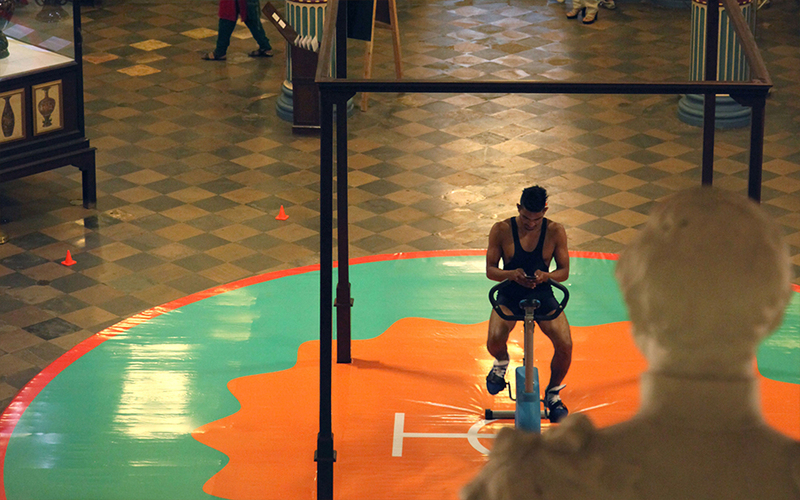 The idea is to create a participatory work which is meditative, challenging, and cerebral. 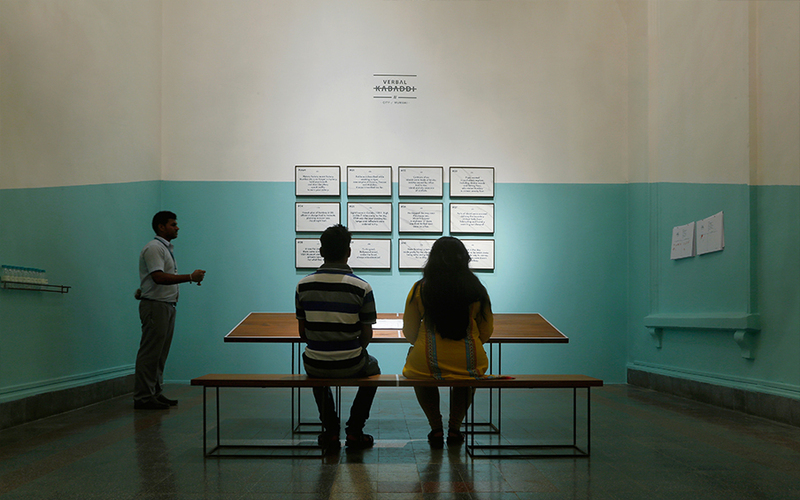 The artists create a verbal version of kabaddi, setting it in an indoor environment, replacing the physicality of wrestling bodies with tongue-twisting texts to be read in a single breath. 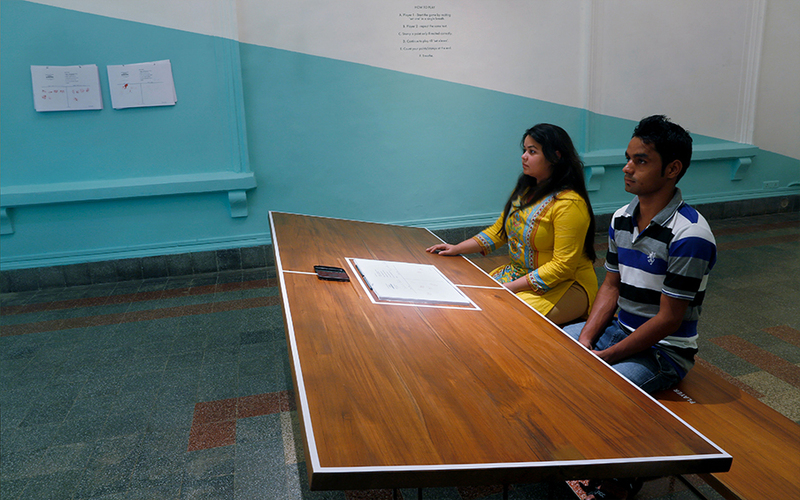 While maintaining the sanctity of the ancient game by combining physical and mental strengths, the participants recount the history of the city of Mumbai, each player competing with his opponent by reciting the given sets of texts. A demanding sport of endurance is transformed into an exercise in concrete poetry, agility and perseverance still being essential. 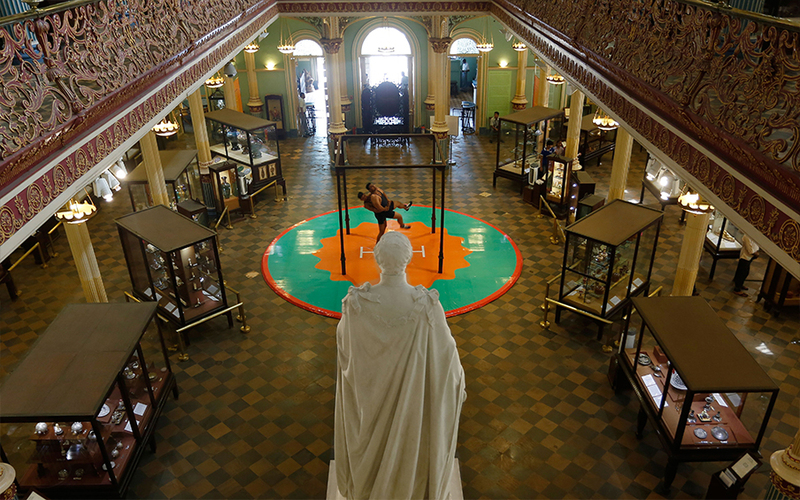 The exercises will be performed by both museum volunteers and visitors, furthering destabilizing the divide between employees and viewers, objects housed by the museum and the subjects who are viewing them. 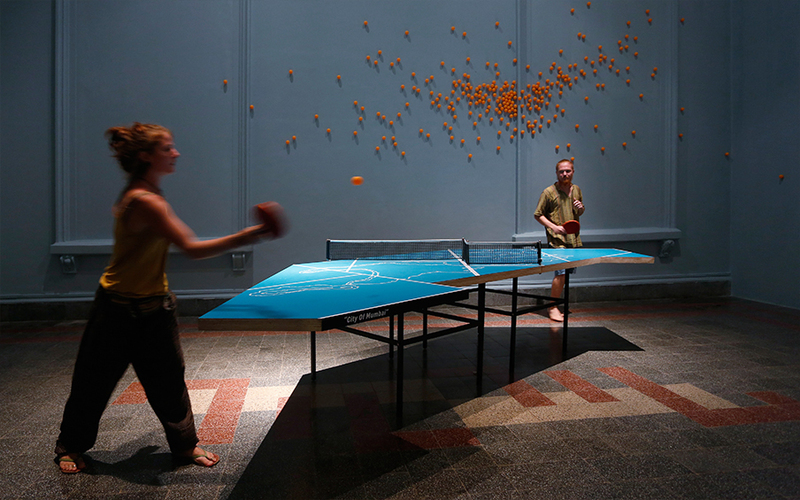 The British ruled the game of table tennis, invented as an indoor version of lawn tennis. A parlor game which became popular in the18th Century, it is still played in schools around the world and is an Olympic sport. 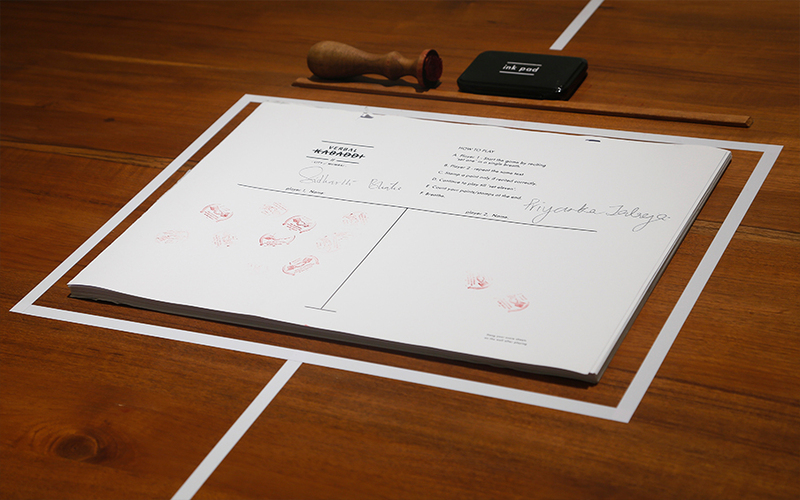 The artists re-design the game so as to be more appropriate for our contemporary times and contemporary dilemmas. The game is a constant flux of strategies and tactics between the opponents who strike an uneasy balance of skill, knowledge and energy. 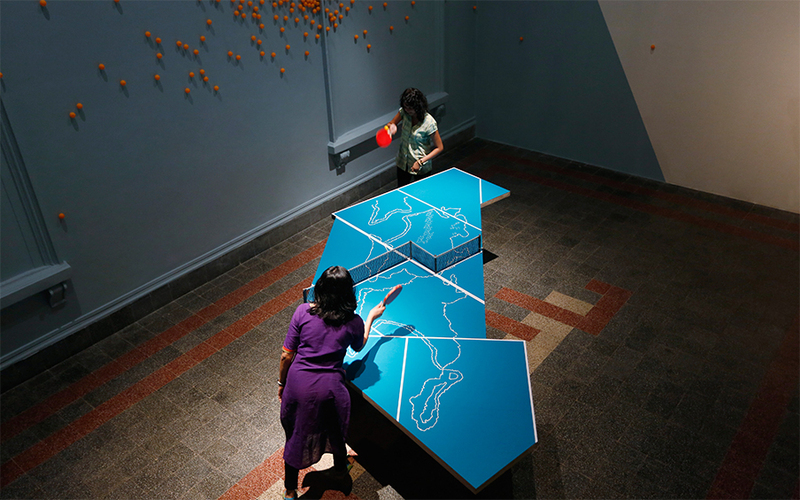 Utilizing history, the original map of Bombay’s seven islands is re-calibrated to become the shape of the table, reminding us how both the land and the people of India were adapted to fit into the British version of rules and by-laws of many different types of games. One of man’s most primordial dreams is that of flight. The artists have created a giant pair of wings that can be worn by anyone, anyone who steps in between them to have their portrait shot, sculpture rendered as photo-opportunity in the age of the Selfie. 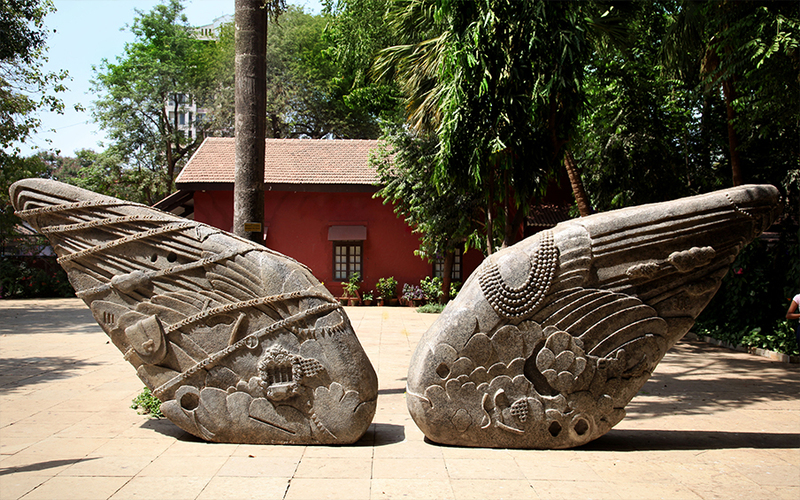 Appearing as ancient monoliths, these wings symbolize the potential of dreams for each individual, the potential for the mind to take flight when it encounters the treasures within the museum.